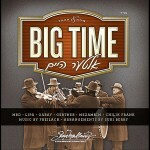 This is an exciting wedding album produced by Sheya Mendlowitz and arranged by Suki Berry. Music was played by the Freilach Orchestra with clarinet solos by Chilik Frank. It is not your typical wedding album. The theme is to bridge the gap between the “Alter Heim” and the music of today. Suki is a master of collections from all sources across the Jewish music spectrum and he shines with some original combinations. The singers are the Mezamrim choir and the Moishy Kraus boys choir along with solos from MBD, Lipa Schmeltzer, Dovid Gabay, Shloime Gertner, and Shalom Jacobs. The hit from the album is Anah Avda sung by Dovid Gabay. It is very hard for me to describe the style from the song. This might be the genius of the “Berry Bunch” . It has a modern flavor with power and is sung with the Sephardishe accent, but I can’t help but feel a haimishe taam with the song. There are several chupa songs with different flavors: featuring MBD singing his Mame Ruchel from his double album as Mi Adir wth a Yiddish high part composd by Lipa and Shloime Gertner singing B’ein Malitz Yosher from his native London Pirchei. The rest of the album features marches, a slow Yiddish song by Lipa, and the closing medley again featuring a combination of different styles: Yeshivish, Chabad, Satmar, MBD, Moshe Laufer, and Seret Vizhnitz. The last 2 songs seem to be like a “Suki signature” because they were both on Suki and a touch of Ding – Chaim Shtehay on Volume 2 and Vosik on Volume 1. The reason I think this way because he tends to do that on previous albums he arranged. For example signing off with the intro. to MBD’s Vechol Maaminim or ” a gantz yur freilich” . The most recent one was on the first Shira Chadasha Boy’s Choir on the last song – Kol Mi.